A plane’s descent into anywhere is breathtaking: the lush green and moody grey of London-Gatwick. The piercing, relentless blue of Nassau, Bahamas. The powerful twinkling of the overwhelming city of San Francisco. Flying into Marrakech, Morocco wasn’t a plane’s descent. It was a moon landing. As you soar through the desert, barren of any life or movement, save the sand blowing over the hard-packed ground, you begin to realize you are entering a world that you are completely unfamiliar with. And as you begin to think, maybe it will resemble Arizona, you are faced with the city. From the airplane, there is no color outside the sandy oranges and clay reds and you know immediately why it earned the nickname “The Red City”. Without skyscrapers and glass castles, the low cityscape absolutely sprawls. There is an inescapable sense of smallness as your eyes fight to understand the magnitude of this ancient city. But this type of unapologetic beauty cannot be understood or interpreted. It is strong, relentless, overwhelming. It is Morocco’s great city. Once on the ground, you begin to recognize that as overwhelming a sight Marrakech was from the sky, the view is nothing compared to being within its walls. On our drive from the airport to our Riad (a Riad is guest house, somewhat like a combination of a hotel and a dormitory, except that it is one of the most spectacularly beautiful places you will ever sleep) we counted seven different modes of transportation sharing the highway with virtually no lanes. Donkeys, scooters, cars, bikes, and vehicles I’ve never seen and could never identify all going their respective full-speed inches from one another. On the sidewalks, police and military men patrolled with AK-47’s and 9mm rifles. Not so much breathtaking as it was heart stopping. Quickly the highways became roads and the roads became alleys and the alleys became walkways until, finally, our cab driver signaled to us to get out and follow him on foot the remainder of the distance through pitch black, cave-like alleys where the homes were connected above cobblestone paths seemingly drilled through the centers of homes. We knocked on the most gorgeous door and as it opened, the stone and clay city melted away behind us and we stepped into an oasis—quit literally—of gleaming tile and ornate doors and tremendous rugs and pillows in the middle of the desert. Out comes our fragrant and somehow simultaneously sweet and bitter mint tea in gorgeous glasses that you’d like to bring home but feel that somehow their ornate and dainty perfection could surely not survive but here, in a dream such as this one. And really, is there any other way to describe Marrakech than as a dream? As you walk into town, there are children playing soccer in the narrow streets and builders carving doors and game boards and the most spectacular works of art. There are women dressed in full hijabs kick-starting scooters straight out of Mad Max. There are cats—Oh, Lord, so many cats—and donkeys and produce stands and rugs hanging from the ceilings. There are smells—certainly not all of them good and some strong enough to make your nose bleed—that outnumber your nose’s ability to decipher. It is a colorless architecture, splashed with more color and culture than you could dream up. Marrakech was Mars to me. But I’ve always dreamed of going to space. 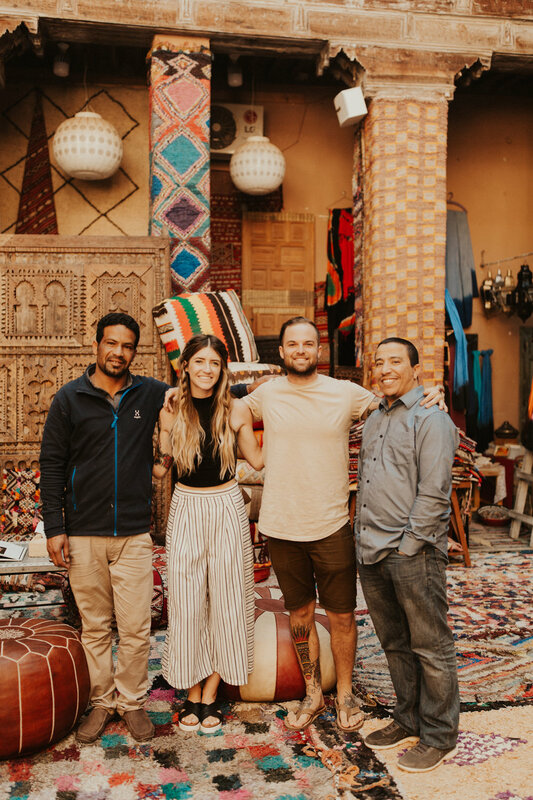 We met some amazing Moroccans on our trip as well. Mohammed, who peddles the most fantastic pottery you’ve ever laid eyes on, has a smile that outshines his products. Noreddine, who is so ready to help you find what you are looking for and share about his journey to do the same. And Saeed, the kindest, most likeable gentleman who helped us find incredible rugs and then invited us back for a tagine lunch of mutton and a desert of pomegranates the next day, made in house and served on a rooftop overlooking the whole city and the mosque. All eaten with our hands, of course. At night, you would be awoken multiple times due to prayer, a loud and unapologetic event. When you have never experienced Muslim culture first hand, that first night, you really start right out of bed from the wailing. And that was the greatest thing we learned in our time in Marrakech: people must be loved before they can be feared. Muslim culture is so distant from our own, so intimidating, that often we forget that these people are sons and daughters, mothers and fathers, friends and employees and, most importantly, children of God. We often revert to fear before love because, lets face it, fear is easier to summon. But far less rewarding. Standing at a waterfall three hours outside Marrakech, a young Arabic girl with no English approached me with her cell phone. I reached for it to take her photo, and she pulled it back and smiled, pointing first to me then to herself and I realized that she wanted a picture with me, the pale, heavily tattooed American girl in a tank top. Her sweet mother, huge smile on her face, everything covered but her face, pointed her iPhone at us as the girl threw her small, tan arms around my waist and I put my completely tattooed one over her shoulders and the waterfall crashed behind us and I realized: this is the stuff. This is what we remember. Crossing barriers of belief and of language and capturing our differences in front of the majesty of the earth, the one thing we can all agree is pretty damn spectacular. Marrakech is a big city in a third world country. Their need looks different than ours, but so do their joys. 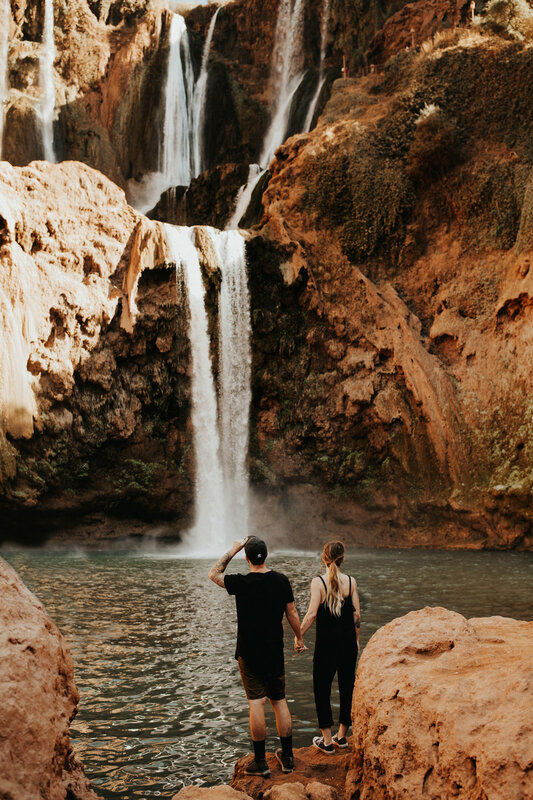 My husband Caleb and I are excited to meet some of those needs through The Merchant Collective and we are equally excited to learn to share in some of those joys as well. Marrakech is where it all starts, but it will continue from here. Surrounded by beauty. That is me, Logan, founder of The Merchant Collective, and my husband, Caleb, backbone and muscle of myself and The Merchant Collective.